Inspired by the mobile gaming ecosystem, Freeform is a new music streaming platform which promotes individual albums as unique free apps full of engaging content. 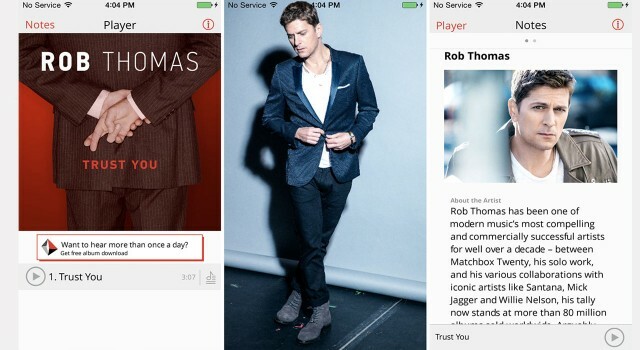 The service launched last week with its first six artists including including Rob Thomas from Matchbox Twenty and Matthew Friedberger from The Fiery Furnaces. Rather than trying to outdo other streaming giants by trumping their extensive catalogues, Freeform is mimicking the online gaming model by making the apps available for free — to attract as many initial users as possible — with the aim of converting a small percentage into paying customers. Each app is unique and designed in collaboration with the artist, but they all contain an album with one free play per track each day, as well as lyrics, photos, videos and digital liner notes. This content is available for free but further content such as unlimited streaming, mp3 downloads, bonus tracks or other perks are only available to customers who redeem a partner offer, as displayed in the offer bar. This model is hugely successful for online gaming apps, and if successful, could enable musicians to earn revenue without charging customers, who are increasingly averse to paying for music nowadays. Partner offers can be anything from a subscription to Rhapsody to a USD 1 voucher at Peet’s Coffee, or a trial with dating site eHarmony. Freeform, which was created by former Google Play executive Tim Quirk, will soon morph into a self service platform, charging artists and their labels around USD 500 for a selection of tools which will enable them to create and promote their own individual app. Are there other parts of the entertainment industry that could adopt online gaming’s model?